Quite literally just last week I was talking to someone about what had happened to A.A.Bondy who was last heard of (musically at least) back in 2011 when he released the outstanding Believers, itself a follow-up to 2009’s equally brilliant When The Devil’s Loose album. Two fabulous records from a brilliant songwriter who then just seemed to disappear without trace. I was excited for a Felice Brothers gig in London a few years ago that he was named as support for, but he couldn’t make it and he remained one of those artists you long to see live, but begin to doubt you ever will. Now eight long years later, we have news of a new album Enderness, that will see a release via Fat Possum Records on the 10th May, and he’s announced some UK live dates in June too. The album was finished the day before a wildfire burned his house down. He recorded and played everything himself. The first single is Images Of Love. You can watch/stream it here, and check the live dates as well. 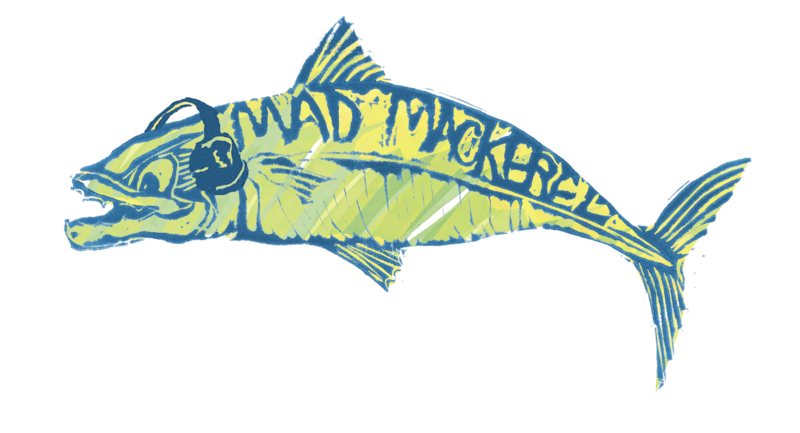 Believe it or not, Mad Mackerel has been around for more than five years now. During that time we’ve posted more than 4,000 times, and offered more than 5,000 songs for your listening pleasure. And more than three quarters of a million people have paid MM a visit during our lifetime on Google’s (godawful) blogspot and since April 2010 on WordPress. We asked some of the regular MM contributors to give us their top twenty songs since MM first went live and we’re also going to give you one big mega-listing shortly, first up was Dr Roddy, then Chris T Popper and now we have the choices of the fragrant, but often blasphemous Polly Pocket. Never fails to put a smile on my face and a spring in my step. It really does capture that feeling when you fall utterly head over heels and there is nothing to be done about it. I love that this song seems to have two such distinct parts to it but they work so beautifully together. Such an incredible voice. Laura can do no wrong in my eyes. A timeless beauty, much loved since 2009. So far it has proved impossible to listen to without singing the end part of the song ‘I know it well’ for hours afterwards. A 2013 tune and already Line of Fire is a song I’d rather not live without. I love Jose Gonzalez’ effortless vocals. Utterly emotional, a bit bleak in places and all consuming. It has a cracking (and very odd) video to go with it too. A lovely discovery for 2012. This song just gets bigger and bigger until you realise you are no longer singing along but shouting like a crazy person! If you like a song to tell you a tale then this is the one for you. It will also make you want to learn to play the harmonica. From 2011’s top ten, a beautiful track. Very dark and brooding, like a lovely storm overhead. No idea what it’s all about but it feels most profound. It was my number 1 from 2012 and it certainly deserves its place here. Is it the voice or the lyrics that are most heartbreaking? Always a stand still and listen to all the way through tune. Timeless, effortless and to my mind perfect. I have yet to find a time or a situation where this tune doesn’t fit the bill. That pretty much sums up the entire album for me, Carry On is a masterpiece. I remember the car journey when I first heard this song – it was a bit of a mind blower and hearing it live the next year cemented it as a firm favourite. The moment the strings start you know its going to be epic and it never disappoints. You know an artist is that good when you kick yourself for not having found them sooner – I could have been listening to ‘When The Devil’s Loose’ since 2009 but only came to it in 2011 having fallen in love with ‘Believers’. There is a real honesty to Kristian Matsson’s songs, I think that is what I love best. He has an incredible voice and writes songs you just can’t help but sing a long to. Always a treat. An unbelievable talent. I was privileged enough to have heard Laura Marling sing in Gloucester Cathedral in 2011 – a very fitting venue for the purest of voices. If she is this good now, what will she be like in years to come? I look forward to finding out. The wonderful Daytrotter recently announced their 2,000th session and managed to get none other than Country music legend Glen Campbell in to record it, followed swiftly by a new session from the brilliant Delta Spirit. For those that don’t know Daytrotter sessions are typically four songs in length, recorded live to quarter-inch tape in a matter of a couple hours, with no overdubs. They are then made available for download and streaming on the site and its various apps. Since beginning in February of 2006, Daytrotter has given away tens of millions of downloads and countless many more streams. In addition to studios in Rock Island and London, Daytrotter sessions are also occasionally taped in San Francisco, CA, Asheville, NC, Nashville, TN and Montreal. Accessing all these sessions plus all the upcoming ones by all the bands you know and love costs a paltry $2 per month. For your ongoing listening pleasure we can’t think of anything anywhere that will give you better value than that. Below are just a very few highlights from some of the sessions we have loved – listen (they should fit neatly onto a CD), and if you haven’t done it yet, go and sign up here. As with previous years we will be posting over the next few days the Top Ten track selections for 2011 of various MM friends and contributors, as well as our Best Albums of 2011 and own best of the year list. To kick us off we have Polly Pocket. A great getting ready to go out kind of a tune. A happy and warm glowing song, it just makes you feel good and there is nothing wrong with that. How can anyone resist a song that starts with Christmas slay bells? Impossible to listen to without singing along. Hard to choose which Laura track to include. The good thing is they all remind me of a fabulous lunchtime not so long ago in a Cathedral with Mrs M.
I have no idea what this song is about but that doesn’t stop it from being great. Nice to have David Byrne cropping up in it too. I find myself frequently humming this tune, simple, stripped back, catchy, great. Dealing with dark matter whilst sounding all happy and light, just my cup of tea. Beautiful voice, beautiful song, timeless. This is such a massive song, all dark and rich, just lovely. Its been in the number one slot forever, a simple and brilliant tune in my humble opinion! Check out her 2010 Top Ten here.